Kook-a-burra, isn’t it fun to say? 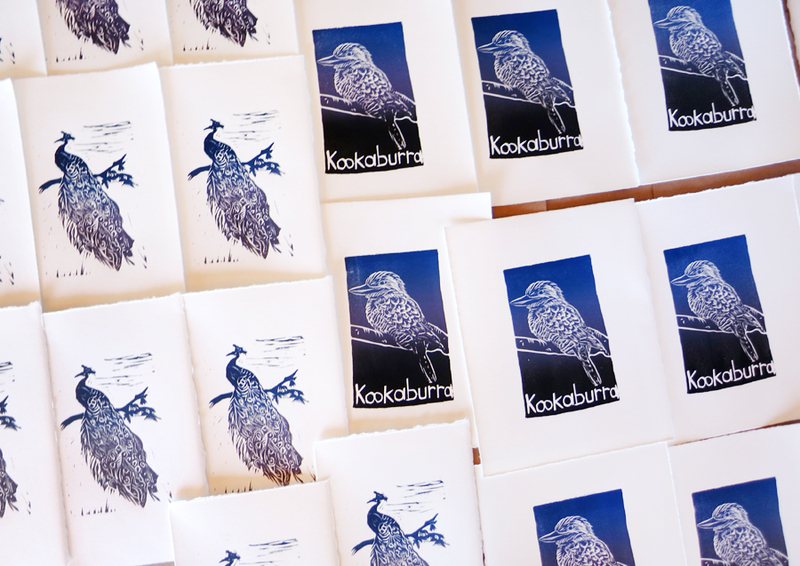 There are 10 Kookaburra’s now on my Etsy Store or $20 each. This is print 15 of 30. Seven years ago I spent three months in Tasmania. I loved hearing the Kookaburras, I also like saying the word, Kook-a-burr-a. 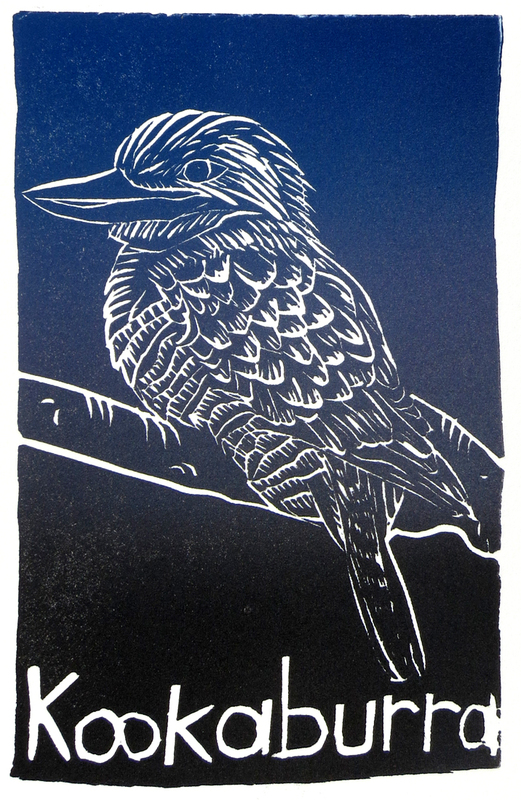 I am missing my Australia friends, the human ones, so in thinking of them I made the kookaburra. This print has a complicated rainbow roll of black to mid-lavender to blue. After I finished printing, I had ink left. I also had paper cutoffs. My paper, Rives BFK is 22″ x 30, it yields, 6, 8″ x 10″ sheets and 3, 6″ x 10″ sheets. So from here on out, I am going to print the cutoffs using the same ink but a different block. The peacock is an open edition and is available for $15 on Etsy. 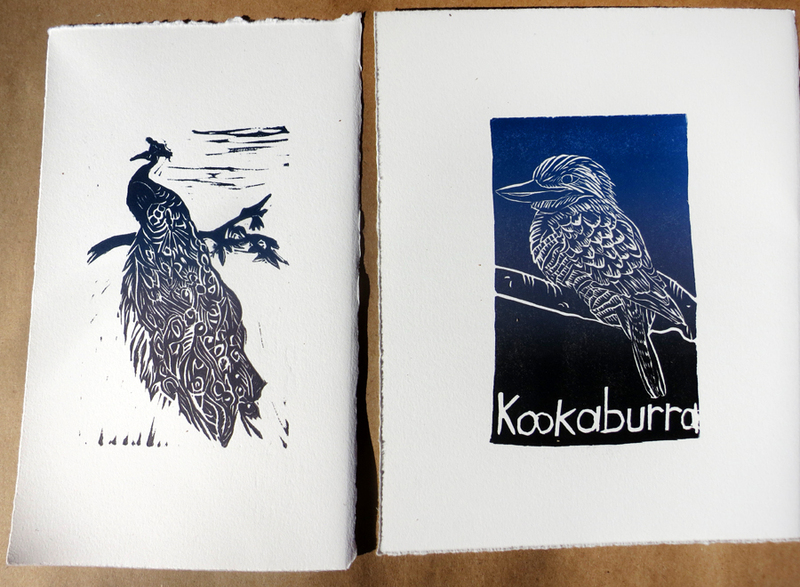 Today you get the Kookaburra on 8″ x 10″ and a Peacock on 6″ x 10″ paper. Image size on both is 4″ x 6″. You can also get free shipping. Now through Monday January 19, type in “Freeshipping” to the Etsy checkout pager and get free shipping on any purchase $40 and over. ← Free Shipping now through Monday!